Legacy in song • Famed Tabernacle organist Alexander Schreiner preached practice in lifelong quest for perfection. Alexander Schreiner had no time for mediocrity. "In the first place one should avoid making a mistake, ever!" Schreiner, who played the Mormon Tabernacle organ for more than half a century, wrote. "When you start to learn something new, play it so slowly that the notes, the time and the rhythm are all played perfectly. Then gradually start to play faster, but it must always be played correctly." That practice philosophy is "such a hard concept" for many musicians to accept, said organ historian Daniel Berghout, who spoke about Schreiner&apos;s legacy in August as part of the Men and Women of Faith Lecture Series sponsored by the LDS Church History Library. But Berghout said it&apos;s sound advice. "The speed comes [with practice], but if you don&apos;t temper your love of speed, you&apos;re never going to get the notes in the first place." The advice also bespeaks a patience that served Schreiner away from the keyboard. He achieved his dream of playing the Tabernacle organ  an ambition he hatched soon after arriving in Salt Lake City as an 11-year-old German immigrant  relatively quickly. But it was more than 40 years before he got the position he truly desired: senior organist. "He knew it would eventually come," Berghout said, "if he kept doing what he needed to do." With or without the title, which he finally attained in 1965, Schreiner&apos;s name was practically synonymous with the Tabernacle organ during his half-century at the console. 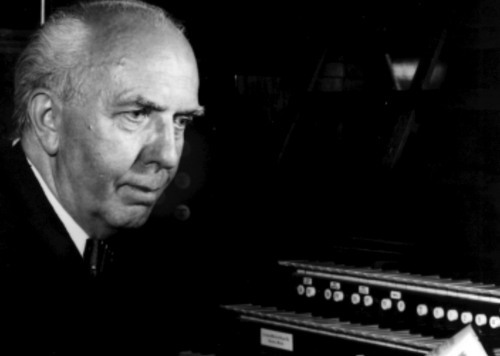 He played on the third-ever broadcast of the Mormon Tabernacle Choir&apos;s "Music and the Spoken Word" in 1929 and continued in rotation with his fellow Tabernacle organists until he retired in 1977. In addition, he produced a weekly radio show on the instrument from the 1940s to the early &apos;70s. His figurative fingerprints are all over the current organ, "even down to the names of some of the stops," said Clay Christiansen, a former Schreiner student who has been a Tabernacle organist since 1982. Schreiner was a key player in the decision to hire prominent organ builder G. Donald Harrison of the Aeolian-Skinner Organ Co. to replace the instrument that had stood in the Tabernacle since 1914. "I said to the church officials that it was sweet, but we had to have something more heroic," the organist was quoted as saying in a history of the Tabernacle Choir. "I needed stronger stuff!" Together with Frank Asper, with whom he shared Tabernacle organ duties, Schreiner advised Harrison on the new organ&apos;s physical layout and tonal design. The instrument took nearly four years to build and install, taking its place inside the Tabernacle in 1948. "Harrison was as thrilled as Schreiner" with the result, Christiansen said; Berghout reported that Harrison considered it his finest work. In his August presentation, Berghout traced the course of Schreiner&apos;s organ career. Born in Nuremberg on July 31, 1901, young Alexander began playing for his family&apos;s Mormon congregation when he was 7. He did the same for an LDS ward as well as a German-Swiss branch almost immediately after the family relocated to Salt Lake City, where he took up studies with senior Tabernacle organist John J. McClellan when he was 13. Schreiner worked as a theater organist in Utah, Montana and Oregon, beginning in high school and continuing until his church called him to missionary service in California; less than a month after his return to Salt Lake City, the faith&apos;s governing First Presidency appointed him as a Tabernacle organist. After some time off for studies in France  where his teachers included the great organist-composers Louis Vierne and Charles-Marie Widor  Schreiner sought a promotion to chief organist at the Tabernacle, but his request was denied. He was third in line in seniority, and Asper had been appointed just a couple of weeks after Schreiner. So, from 1930 to 1939, he divided his time between the Tabernacle and the University of California at Los Angeles, where he also was organist. He returned to Salt Lake City full time at the encouragement of then-church President Heber J. Grant in 1939, though he continued to play recitals across North America. He also performed frequently with the Utah Symphony, which premiered his organ concerto  with Schreiner at the keyboard  in the Tabernacle in 1956. "Schreiner was a world-class figure," said Ardean Watts, the Utah Symphony&apos;s associate conductor during the last nine years of Schreiner&apos;s Tabernacle tenure. "It would have been just as appropriate for him to play with the New York Philharmonic as the Utah Symphony." Schreiner, who died in 1987 at age 86, became a towering figure in Mormon music, writing a book of devotional pieces for church organists to play, composing hymns (nine of which are in the current edition of the LDS hymnal) and penning instructional articles for church magazines. He was outspoken on the role of music in worship as well as on matters of technique. "He was bold in the way he approached things when it was something he knew was very important," Berghout said. "For some reason, he didn&apos;t offend too many people with his boldness. … He was the right person at the right time to lead LDS Church music to where it is today."